A saving that will be music to your ears in more ways than one. If you’ve been holding off on a surround sound system for your gaming setup then now might be the time to pull the trigger. Amazon UK is offering 20% off Logitech’s explosive G560 surround sound system—that’s a saving of more than £40. It’s currently £166.99. The system delivers a vast soundscape of audio to really enhance an immersive gaming experience, while also executing 3D positional audio to enable you to hear and analyse your environment from every angle. The two satellite speakers and the big down-facing subwoofer will produce the clearest of audio at all ranges and levels, and you’ll also be able to connect up to four devices to the sound system through Bluetooth, USB or 3.5mm audio connection. It’s even got some fun RGB lights that will change with your game’s audio. 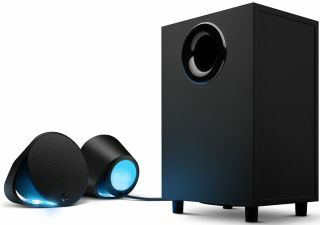 All in, it’s a great price for a fine surround sound system, and currently tops our list of the best computer speakers. Get this mighty sound system for a whole lot less right now at Amazon UK. It'll have your gaming set-up bouncing around the room...in a good way. If you’re not interested in PC speakers, then there are plenty of other options out there, including the best gaming headset options right now.